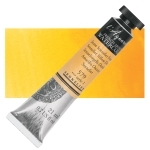 Nickel dioxine yellow is a semi-transparent, lightly staining yellow pigment with high tinting strength, although less than that of the diarylides. It is considered a good color match for Indian Yellow, a historic pigment that is no longer available. Drying time is average. Nickel Dioxine Yellow has excellent lightfastness. Nickel metal is toxic and may irritate skin.